See, this is what happens when you have a backup goalie you trust. You can, you know, play him occasionally. Jhonas Enroth will start tonight for the Sabres against the Canadiens in Montreal, his third nod in six games after receiving only two in the first 24 contests. 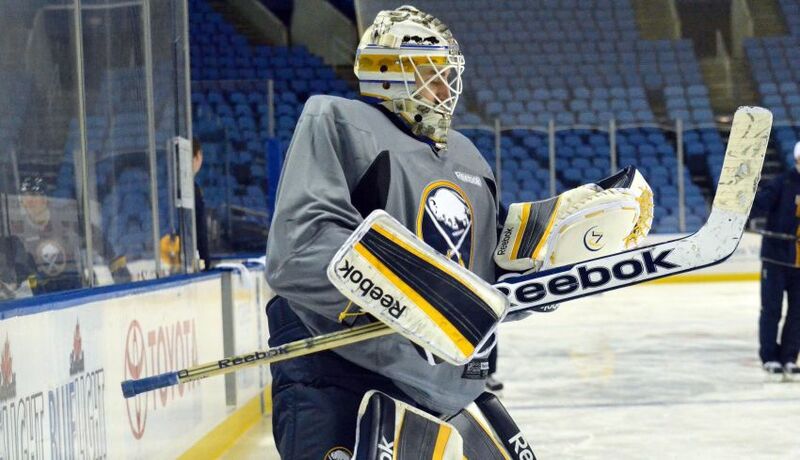 This was originally the Sabres’ plan; Enroth would spell No. 1 netminder Ryan Miller regularly, start about every fourth game. With Enroth playing well again – he won his first game in 16 months last Tuesday with Miller sidelined and dazzled in a March 2 loss – the Sabres are wise to take the option. They have three games in the next five nights. Clearly, the Sabres’ lost season has been wearing Miller out physically and emotionally. Despite some fine play, Miller’s only 9-13-4 with a 2.96 goals-against average and .909 save percentage. Opponents have pumped an NHL-high 744 shots on him, 70 more than Colorado’s Semyon Varlamov, the next closest goalie. Based on Miller’s emotional postgame comments throughout this trying season, an occasional day off wouldn’t hurt. Enroth has played dynamically in two career starts in Montreal, winning 3-2 shootouts on Feb. 15, 2011 and Nov. 14, 2011 with clutch performances. With the Sabres in 14th place and going nowhere, interim coach Ron Rolston would be wise to turn to Enroth regularly the rest of the season.